When I was growing up, the future was always bright and full of potential. The year 2000 was going to bring Virtual Reality, completely customizable cars, and video games the likes of which we had never dreamed of. Two of those have come true by 2017. Maybe it was just childish naiveté, but things seem to have changed. When I watch TV or movies about the future now, it seems we’ve lost the dream that tomorrow can be better than today. We are obsessed with apocalypses. Zombie, nuclear, genetic, viral. It seems that the only future we in North America can see is one with abandoned sky-scrapers crumbling onto vine-choked streets or desert wastelands spanning across once fertile country. Gone are the dreams of flying cars, the eradication of disease, and the human potential. On Saturday, I watched Disney’s Tomorrowland, which ponderously addresses this very issue. While the pace may have been slow through the first and second acts, the final questions that the movie asks more than make up for it. For those who haven’t seen the film, there are spoilers ahead. Go, watch the movie, and come back when you’re done. Alright, here’s the good stuff. Near the end of the film, we find out that the machine that has been “predicting” the violent end of humanity has been projecting that message to everyone on earth for over twenty years. Instead of opening our eyes to the potential for disaster, humanity becomes obsessed with the impending doom, forgetting about the possibility of a better tomorrow. And then Nix drops the biggest bomb I’ve heard from a Disney film in a long time: people accept a bleak and hopeless future because it asks nothing of them today. Think that over for a second. Hope for a better tomorrow asks something of us. It asks us to work for the future. It tells us to work hard, think fast, and overcome obstacles, because in doing so, we build toward the shining world we want. If we pull together and think of someone or something other than ourselves, we can defeat the world-destroying problems that threaten to overcome us. Doom, however, does not ask us to work hard. It doesn’t ask us for anything. It asks us, instead, “What is the point? You’re just going to die anyway.” It tells us we can’t fix anything, so why try? Just enjoy the here and now before it’s too late. But, as Christians, we know that the world does not end in doom. We know, in the end, Good wins. And that should inspire us each and every day. Evil is overwhelming. But God is more so. This week, ask yourself if you have, consciously or unconsciously, accepted a bleak future and have turned inward in response. Spend a little time meditating on your thoughts of the future, and your responsibility in its formation. Are you going to accept the dying of the light? Or rage against it. In this case, I choose to rage. Well, my plan to write a lot over December failed miserably. It turns out that having term papers to write and finals to prepare for took a lot more of my time than I was expecting. Coupled with preparing our new family for the Christmas season led to Epic Theology taking a back seat for a few weeks. But we’re back, and hopefully on track now. Many devout Christians that I know struggle with the idea of Santa Claus. As new parents, they have to decide if they will raise their children with Santa Claus or without. Many feel that Santa is the symbol for the commercialization of a holiday that is meant to celebrate the birth of Jesus Christ. To further propagate this de-Christianized Christmas by making the holiday about a fat man in a red suit jars with their faith. Yet, to be the only 8-year-old in class who doesn’t believe brings its own challenges. So, how do we plot a course through this maze of Christmas turmoil? I was raised believing in Santa Claus, but he was never the main event of Christmas. I was told that St. Nick worked for Jesus, bringing presents to people on Jesus’ birthday because Christ was in heaven and didn’t need any presents. I was excited to open presents on Christmas day, but I was also excited about the children’s pageant at church or the lighting of the advent wreath at home. Even as a child, I knew that Santa, while fun and exciting, was not as important as Jesus. But is there any real merit in the jolly old elf? I think so. Santa is a symbol for far more than Coca-Cola and shopping malls. He is a symbol of hope, joy, and generosity. There is something incredibly magical about the hope that someone loves you enough to sneak into your house to leave you exactly the present you were wishing for. The idea that someone you have never met face-to-face has your happiness in mind, and spends all year preparing for it, gives a glimpse into how we are loved by God. He has the best gifts ready for us, and is willing to come to us to deliver them. I think we sometimes lose how amazing that truth is, but we can relearn by watching children with Santa Claus. It is very easy to allow the joy to be sapped out of the holiday season. Gifts to buy, gifts to wrap, gifts to transport across the country, along with parties, events, games, and relatives, all add up to a lot of effort over Christmas. I know many people who allow themselves to get incredibly stressed right up to Christmas Eve, and then expect the magic of the day to take over. This is silly. We need to realize that joy, the kind that is symbolized in the jolly, round tummied Santa Claus, is a choice that we can maintain throughout the season. If all of December is a joyful event culminating in the magic of Christmas Day, imagine how much less stress would enter into our lives. Finally, Santa reminds us each year that it truly is better to give than to receive. Watching the faces of loved ones as they open the gift that I have spent time and resources to get for them is such a blessing to me. Even the Bible affirms this truth: “In everything I did, I showed you that by this kind of hard work we must help the weak, remembering the words the Lord Jesus himself said, ‘It is more blessed to give than to receive. '” (Acts 20:35). Christmas is the time where we should be thinking not about ourselves, but about others. We bake and cook and shop to please those we love. And hopefully, we can go beyond this to help those we may not love, but need our help anyways: the homeless, the hungry, the noisy neighbours next door. Our generosity, like that of St. Nicholas, and Jesus Christ, should have no bounds. In the end, what will we teach our son about Santa Claus? We haven’t decided yet. I am not opposed to those who decide not to join in with the myth of Santa, especially for religious reasons. But I know that Christmas magic will be palpable at our house. We aim to blend the sacred and the celebratory to give Jesus Christ a birthday that is memorable each year. Christmas is my favourite time of year, with Santa serving the Lord Jesus right beside the rest of us. How about you? What do you teach your kids about Santa Claus? 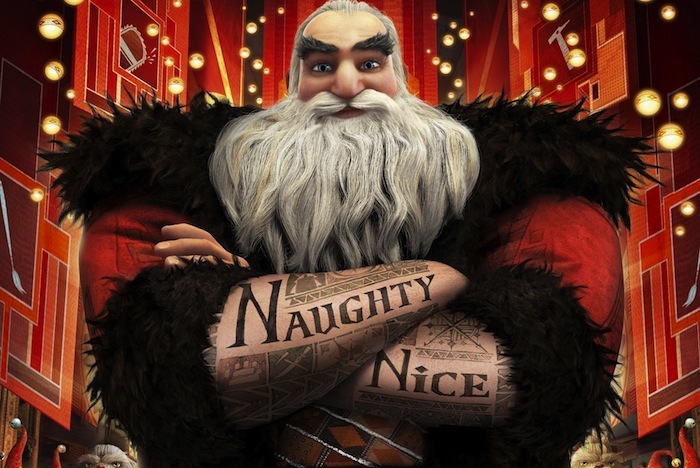 Do you think Kris Kringle can be redeemed for the faithful? Chime in! Merry Christmas to all of our readers who celebrate Christmas, and Happy Holidays to all those who do not!